For those that don't really need an example, and know triggers already well enough. The most basic overview of what's needed to get a dialog up and running. and want a step-by-step guide on how to get started. For those with more advanced needs. Have fun and a good read. And don't be afraid to ask in the forum. This tutorial also has a free demo map. Create a variable of type "Dialog". Create a variable of type "Dialog Button", for every button your dialog is going to have. Dialog - Change the title of myDialog to "Some text"
Dialog - Create a dialog button for myDialog labeled "Text to show on button"
It's a box, with a title at the top, here it says "My first dialog"
And a button, also with some text: "This is a button". To get this on the screen, you first need a variable, of type "Dialog". The looks, title, buttons, button text, are stored in that variable. So, open up the Trigger Editor. Now we have a variable we can work with. that will use this variable to set the title, add a button and show it on the screen. Give it a name, like "MyFirstDialog". Then we need an event. Without event our trigger will not run. the easiest event is "elapsed game time". that counts how much time has passed since the game started. Right-click on "Events" (in the lower right part) and choose "New Event". select "Time - Time elapsed". The text below will then change to "Elapsed game time is 5.00 seconds". With a click on the blue "5.00" you could change the time. Five seconds is ok though for this example. Confirm your choice with "Ok". Note that we can not show a dialog at Map initialization. That's too early. At that point there's nothing in the screen yet. We do not need a condition. But, we do need a new action. Again, right-click the "Actions", and choose "New Action". In the "Action type", that says "All", choose "Dialog". We're going to need all of them, the first one being "Clear". In the text below we then can choose which dialog we want to clear. 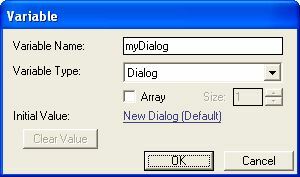 Click on it, click on "Variable" and make sure the variable is "myDialog". Confirm with "Ok", one more time. 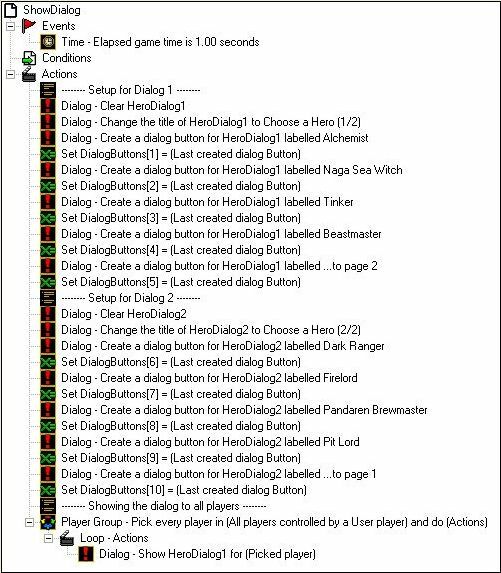 Our first dialog action is ready, it says "Dialog - Clear myDialog". Dialogs should always be cleared before you start using them. It's to remove any "mess" that might be there and that you don't want to show. New action, this time "Change Title". For "Dialog", we choose again "myDialog". Then click the "Title" and enter some text, "My first dialog" for example. Confirm with "Ok" as needed. Once done, the action will say "Dialog - Change the title of myDialog to My first dialog"
New action, "Create dialog button". Change "Dialog" to "myDialog" as before (click, variable, myDialog, Ok). Click on "text" and enter some text. That's the text that will appear on the button. This example uses "This is a button". New action, "Show / Hide". "Show" should already be there. "Dialog", as before, needs to be changed to "myDialog". Finally, we need to choose a player that's going to see our dialog. "Player 1 (red)" is a good choice here. You could already run the map at this point. Five seconds into the game, the dialog would show up, and you could also click the button. The game has no idea yet what we want to do with that dialog. So, we first need to tell it. Make a new trigger, give it some name. I will call it "Button". Note that these names are of no importance to the game. They are only for you. do you still know what it was doing? That's why you should always choose a name that actually tells you something about the trigger. This trigger needs an event too. There's a ready to use event called "Dialog - Dialog button click". So, right-click "Events", and choose it. As before, "Dialog" needs to be changed to "variable", "myDialog". Since our dialog here only has one button, there's no problem with knowing which button was clicked. But, dialogs can have multiple buttons. And we need some way to, later on, decide which button was clicked. That's done with the help of "variables", of type "Dialog Button". Then this variable needs to hold the actual button. The action that does that is called "Set variable". You'll have to use it immediately after you create a button. then right-click and "New Action". The action will be "Set variable". then click on value and choose "(last created dialog button)". If your actions are in the wrong order, move them around. and let the button go when your are at the correct place. Now we can complete the "Button" trigger. We're going to add a new condition, that checks for our button. Right-click, as usual, the "Conditions", select "New Condition". The condition we're looking for is "Dialog Button Comparison". Find it in the list. The part "(clicked dialog button)" is ok already, since we want to compare the button that was clicked with ours. "Value" needs to be changed to our button ("variable" and "myButton"). All we need then is some action. and set the text to whatever you like to see on screen. All that's left to do now, is running the map and seeing our first dialog in action. 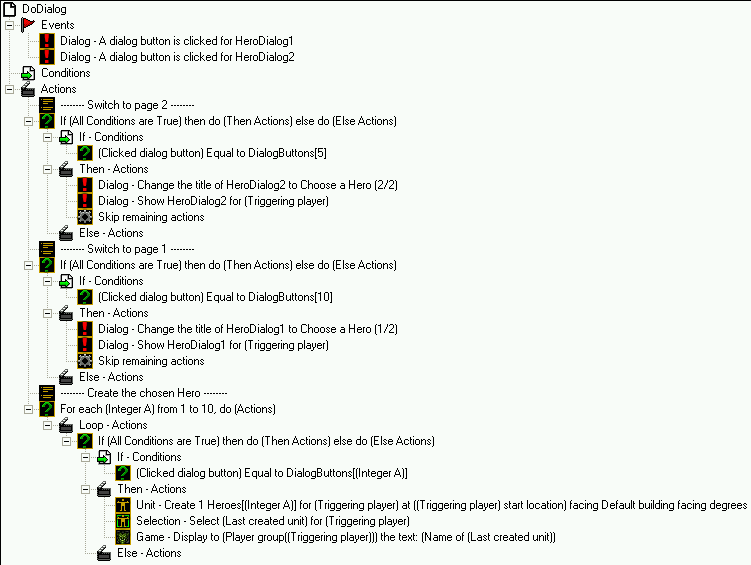 Which completes the very basics of Dialog handling. 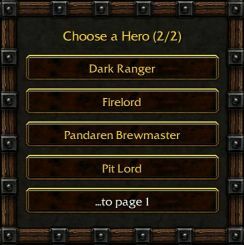 What we want to do here, is create a Dialog that allows the player to select a Hero. and Dialog 2, with four (4) more. Each Dialog will also have a button to show the next or the previous "page". Since we have two different Dialogs, we're also going to need two different dialog variables. 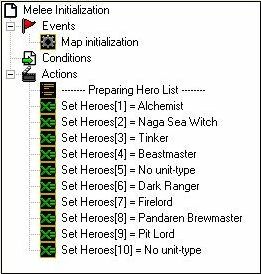 In the following parts, those dialog variables are called "HeroDialog1" and "HeroDialog2". Every button we want, later on, to refer to, i.e. to use it, will need to be, somehow, remembered. With, obviously, yet another variable, of type "Dialog Button". How many buttons do we need? Remember, what we are trying is selecting a Hero. We have eight (8) Heroes in our Dialogs, and two (2) "navigational" buttons. That's ten (10) buttons, all in all. We could, of course, create ten (10) variables of type "Dialog Button". But, there's a much simpler way: we're going to use an array. We'll only have one "Dialog Button" variable, and we're going to give it room enough for storing all ten (10) buttons. So, we'll have a variable, called "DialogButtons", of type "Dialog Button", being an array, and having a size of ten (10). if button "to page 1" was pushed, display page 1.
if button "to page 2" was pushed, display page 2. Since we already have an array for our buttons, let's create one more array for our Heroes. New variable, of type "Unit-Type", being an array, of size ten (10). Ten (10) buttons, but only eight (8) Heroes... so two places in the Hero array will have to stay empty. That's where the buttons say "to next" or "to previous" page. We need to fill our Hero array. So, once we get to the dialogs, we'll make sure that button 1 will say "Alchemist", button 2 "Naga Sea Witch", and so on. Button 5 will be "to page 2", and button 10 "to page 1". The button setup needs to be done in a different trigger. Dialogs can not be set up and shown at Map initialization. That's too early. There's nothing on the screen yet at that point. So, we "wait" a bit, one second here (if that's "too long", change it to "0.25"), and then we create and show them. Dialogs should always be cleared before you put any buttons inside. It's, basically, to clean up any previous "mess". The text that shows at the top of the dialog. Our first button, with some text on it. It will be remembered as "DialogButtons". The same, for button 2. The button to switch to page 2. Then we repeat all this one more time for the second dialog. and use "Dialog - show". Now we already have a dialog showing up on the screen. It isn't doing anything yet, however. Does everything we wanted our dialogs to do, in one go. There's a special event, precisely for waiting on "buttons". This trigger will be used for both dialogs together, so we can handle both events in the same trigger. The only way to get a button event is through showing a dialog first. Our condition here does a "Dialog Button Comparison". 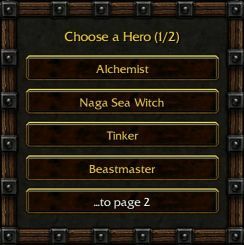 If the button was "to page 2" we show the second dialog to the player that clicked the button. And, if it was that button we also "skip remaining actions", so the trigger will finish here. Just before showing the dialog again, we reset its title. If you don't and simply switch a couple of times between the two, you'll notice that the title disappears! Setting the title every time before showing the dialog prevents this. There's no need to remove the dialog that was there before. They automatically disappear whenever a button is clicked. On button 10 ("to page 1"), go back to dialog 1. See the previous note on why we set the title again. If we get here, our player actually wanted a Hero. we can do a simple loop. The loop goes from 1 to 10, since there are 10 buttons. we can create a unit from our Unit-type array. so he doesn't have to first click on him. And we show the name of the Hero. Which brings us to the end of this "Dialog Tutorial".